News that an AP intern working in Mexico was found dead in an elevator shaft on Saturday will surely mute projected new president Enrique Pena Nieto's celebrations. Mexico’s Institutional Revolutionary party (PRI) was set to be celebrating today as early election results show Enrique Pena Nieto as the winner of the presidential poll. However, news that an AP intern working in Mexico was found dead in an elevator shaft on Saturday will surely mute celebrations, reminding the new president of the social problems he will soon have to work against. Mr Montano’s body was found in the elevator shaft of an apartment building near where he was living in the capital’s Condesa neighbourhood. The circumstances of his death were being investigated by Mexican authorities. During his time in the bureau, Mr Montano covered stories including the saga of nine young elephants from Namibia who wound up on an animal reserve in Mexico’s Puebla state, and the shooting of three federal policemen at the Mexico City airport. Twenty-two year old Armando Montano was fulfilling a placement with AP before starting a Master’s degree programme in the Autumn. The last report Montano wrote before his death was on a shooting of three policeman involved in an anti-drugs mission, a connection that may raise eyebrows among those fully aware of a history of dead journalists at the hands of Mexican drug gangs. 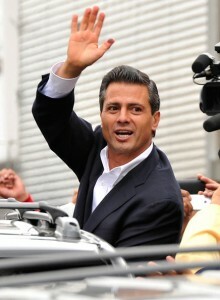 “For the past six years, Mexico has witnessed an extreme escalation in the activities of gangs and drug cartels. In 2010 alone, Amnesty International reports, the government had recorded 15,000 gang-related killings, particularly in the northern states. “Discerning the responsibility for individual acts of violence is difficult enough in Mexico, but even more so when the diviners of truth – the journalists working in the country – are themselves so often the targets. The Institutional Revolutionary party was in charge of the country for seven decades before losing the election to Vicente Fox of the Alliance for Change in December 2000. Fox was succeeded by Felipe Calderon of the Partido Acción Nacional in 2006. According to CNN, Nieto is the projected winner with round 38% of the vote.